Astronomers used the NASA/ESA Hubble Space Telescope to analyse light from the nearby star TRAPPIST-1 as it passed through the atmospheres of four Earth-sized planets in the star's habitable zone – the region at a distance from the star where liquid water, the key to life as we know it, could exist on their surfaces. The astronomers were looking for the signatures of certain gases, including hydrogen, in the atmospheres that were imprinted on the starlight. 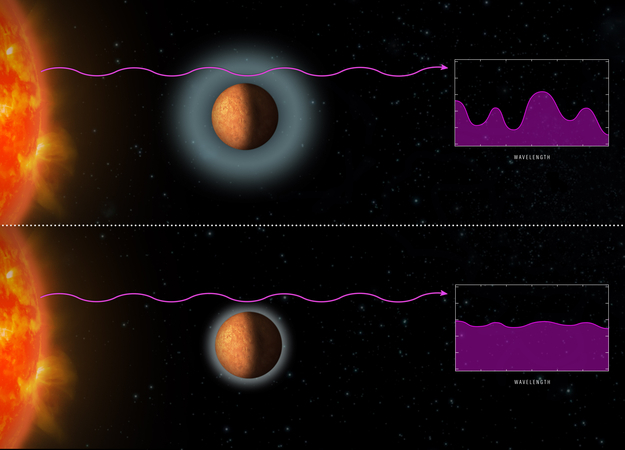 The graphic at the top shows a model spectrum containing the signatures of gases that the astronomers would expect to see if the exoplanets' atmospheres were puffy and dominated by primordial hydrogen from the distant worlds' formation. The Hubble observations, however, revealed that the planets do not have hydrogen-dominated atmospheres. The flatter spectrum shown in the lower illustration indicates that Hubble did not spot any traces of water or methane, which are abundant in hydrogen-rich atmospheres. The researchers concluded that the atmospheres are composed of heavier elements residing at much lower altitudes than could be measured by the Hubble observations.